Every day, millions of users log on to their favorite online forums and communities, and interact with others to get advice and discuss everything from the latest news and trends to their hobbies and professions to whatever else strikes their fancy. Community managers and administrators have to lead these communities, deal with difficult users, manage staff members and make tough decisions. What is talked about in this book is not hypothetical – it consists of in use, battle-tested theories and solutions, making it so that when you must deal with these issues on your forums, you will be better equipped. Real life examples are cited throughout, including the actual user guidelines, staff member guidelines and more, from real communities. This is a book for both new managers and experienced ones. If you are new, it will give you a major boost as you grow your knowledge and build your community. If you are already an administrator that’s leading a successful community, the book can enhance your knowledge and give you more to think about and, with that, even more experience for you to pull from. 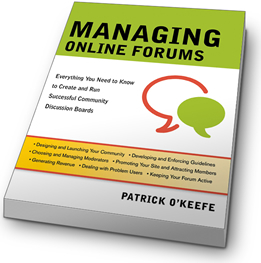 Managing Online Forums is the one book that shows site owners and administrators how to create a safe and entertaining community that users will return to again and again.